Moving away from its ‘norm’ in travel retail, Accolade Wines has announced its latest release from the Hardys label - a range of four rare fortified wines. Initially showcased at this years’ TFWA Asia Pacific Exhibition and Conference, the range has already received high praise. 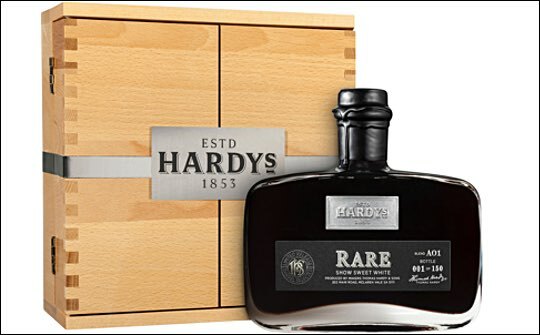 A project that has taken just over 18 months, the Hardys Rare Fortified range consists of the Hardys Rare Show Sweet White (only 150 bottles produced), the Hardys Rare Liqueur Sauvignon Blanc (346 bottles produced), the Hardys Rare Tawny (864 bottles produced), and the Hardys Rare Muscat (784 bottles produced). These wines have been crafted from reserve wines matured in barrel over many decades. Accolade Wines’ portfolio offers a broad range of New World Wines, including: Mud House, Da Luca, Grant Burge, Viña Anakena, Arras and Geyser Peak.